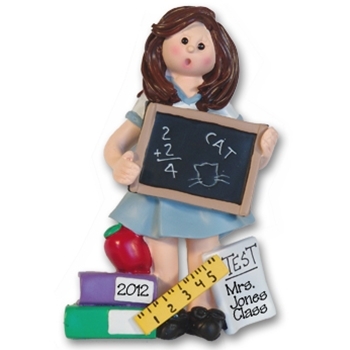 From Deb's new "Giggle Gang" Collection, this female teacher ornament is in the middle of a school lesson. She may do better though if she were to personalize her test with her name! It is easily personalized and makes a great gift for the teacher. It comes complete with a hook and satin ribbon for hanging. Measures approximately 4 H x 2½ W"